I have a pretty good eye for noticing when things are different, even when I can’t quite put my finger on what has changed. So it came as a shock to me when I suddenly realized that sometime in the last decade an entire Rainforest Cafe has disappeared. I know what you are thinking: throw in an evil logging company and this sounds like a great idea for a white water raft ride. But it really caught me off guard. You see, I happened to be browsing old maps of Animal Kingdom, because that’s what all the super cool people do on a Friday night. And something jumped out at me. Something that I remember as plain as day from Animal Kingdom’s early years, but hadn’t thought about in probably a decade. Below is a progression of a section of Animal Kingdom guide maps, focusing on a section at the very front of the park. Guide Map Progression Studies: It’s Not Just for Jocks and Cheerleaders Anymore. 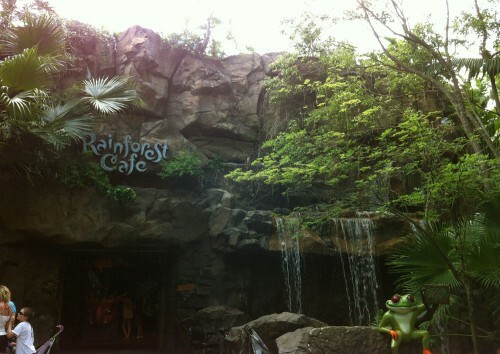 For those of you who forget about it (I know I always do), that’s the Rainforest Cafe. At one time, it was the only full-service restaurant in the park, and it wasn’t even run by Disney. I’ve never been Rainforest Cafe’s biggest fan. I find it over-priced, under-quality, and non-nutritious (which also happens to be the order of importance in food criteria for me). I think I have eaten at Rainforest Cafe twice in my entire life, most recently in 2002. Like I said, not the biggest fan. But I always gave the Animal Kingdom Rainforest Cafe credit for one thing: An elegant exterior. Rainforest Cafe debuted on Disney property over at the Downtown Disney Marketplace well before the Animal Kingdom version opened, and its weird mix of papier mache volcano and shaker shingle roofing always bothered me. Throw in some average rock work, cartoon elephants, and a few retention ditch fountains, and it just reminded me of a pricier version of Chuck E. Cheese. But the Animal Kingdom location was not like this at all. Its rock work matched the quality of the park itself (forget Radiator Springs; Animal Kingdom is positively bursting at the seams with fine rock work). The hokey volcano was gone, and in its place was a shimmering, panoramic waterfall, draping over the entire facade of the building. As much as I loathe the restaurant itself, that waterfall exterior was exquisite. I’ve never seen anything like that before. It was like dining inside Niagra. 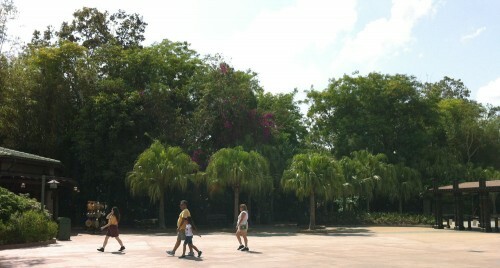 It made for one of the prettier, abstract visuals of a trip to Animal Kingdom. And at some point in the last fifteen years, it has vanished. To find this restaurant, you only need two things: a compass and a machete. You can’t even see it now. The building is completely obscured by jungle growth. Venture back to the restaurant entrance and you will see two waterfalls, but the rest is just stone and bamboo. It’s much more like a real rain forest now. There are no good picture-taking angles anywhere. This is the best I could do. Pictured: Breathtaking waterfalls. Also weird frog. 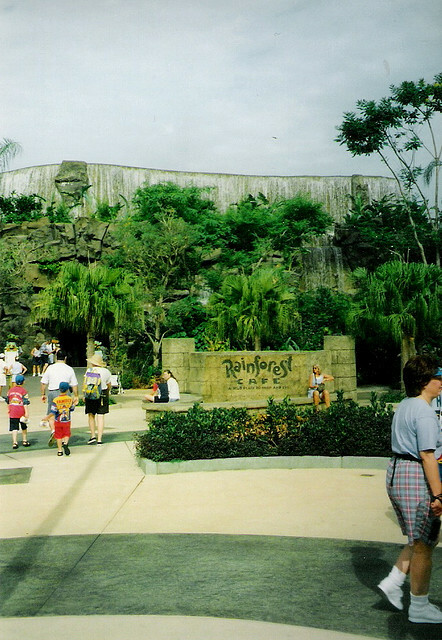 And here’s another one, taken from outside the security gates, where you once had a clear view of the Rainforest building (that structure on the left is the hexagonal shop shown in the guidemap pictures above). Fine dining with a touch of rampant overgrowth. The entire building has been erased from existence by the lush foliage. It’s interesting that Disney has gradually redrawn the Rainforest building on the map. At some point in the not too distant past, they were still sticking with the image of a waterfall building. But in today’s version, they have finally narrowed it down to the 2 remaining flows. In all three versions of the map, the shimmering pool of water on the building roof is just artistic license. It was never that way in real life. I did find an old picture by chrischris on flickr of the building in its former glory. It was quite a sight, and it makes me sad that they got rid of it. Even today, when studying the current facade, I couldn’t tell where exactly the changes had been made. Obviously at some point they either added more rock work or ripped down old structures. The picture below certainly made the building seem taller than it looks in real life today. If you’re interested, you can spot a few more images here and here. I’ve never once missed eating at Rainforest Cafe, but I’m pretty amazed to find out I’ve missed this icon of Animal Kingdom’s early years. I still wonder how I forgot about it. Maybe they’re putting something in the food. 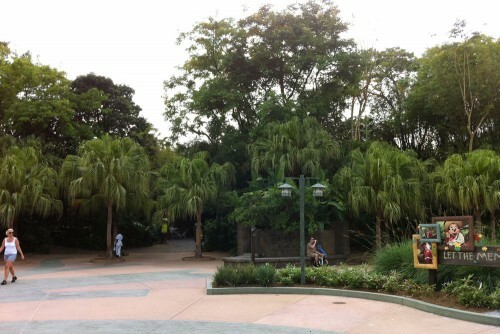 This entry was posted in Lost and Abandoned Disney Details and tagged Disney's Animal Kingdom, Rainforest Cafe. Bookmark the permalink. Do we get an explanation about that secret river door? :)!! The explanation for the secret river door is buried somewhere in the parkeology archives, but only those with a cunning mind and an eye for history can find it. it’s secretly nothing at all, right? I have been aware of the disappearance of the falls for quite some time but I had not realized just how different and overgrown the area now is. In my mind it was always like this… after all even in those early days the place was tucked out of the way, off to the side and outside the park. I hate RFC (not to be confused with KFC) even more than you and yet I always felt kind of sorry for them… here they were the only sit down place to eat and NO ONE went there. The park closed early (even earlier than today) so it was basically only a lunch spot and it was so far hidden that I never understood how they stayed in business (kind of like the ESPN place at Wide World of Sports). Who the heck was going to trek from say Africa all the way out of the park to pay for a crappy lunch… then go back… not gonna happen. But today it is literally impossible to even see, there are better options within the park and they don’t even have the damn falls to draw people over (plus the whole idea of the place is a lot less novel than it once was)…. how do they survive? Seeing those old photos is a shock… but I applaud Disney. Rohde always said that they were going to let the park more or less be natural and just grow… not trim things, not cu things back… that is certainly the case here. I bet the opening day versus current day photos from AK may be the most dramatic from any park. I think they even removed the waterfall structure up there, not just hid it. Could be mistaken though. You can make out footers and a vague outline of the old structure for the waterfalls on the roof. I agree, Joe, it has to have been an add-on to the existing building. The current building is just way too short to have accommodated it.